National Bake For Family Fun Month, celebrated all of February, provides a reason to put down the Domino’s menu. Baking, nearly as old as humans, is steeped in tradition, both familial and communal. Tactile teachings passed down for generations serve as cultural markers and historical signifiers. Eschew the growing trend of takeout food, and enjoy another opportunity to be near your loved ones as you bake together this month. Alfred Bird creates it for his allergy-prone wife. A recipe includes instructions for "cup-sized cakes." They were baking centuries before the first appearance in any English text of baking. It becomes established as an occupation in the Roman Empire. It was used primarily to cook mammoth. Baking is for anyone willing to do it, so celebrate this inclusive value as you recruit your younger siblings, cousins, or kids to help you cook more basic recipes such as pancakes. The wild yeast present in sourdough bread makes it one of the least acidic varieties of bread to consume, and thereby one of the easiest on your stomach. Cultivating wild yeast is tough even for an experienced baker, though, but succeeding in spite of this makes the loaf even tastier. If you’re determined to make this February the best Bake For Family Fun Month but have minimal baking experience, buy a cookbook and pre-packaged ingredients for your first few runs, branching out as you become more comfortable. For Passover, those of the Jewish faith eat unleavened bread. While your family’s tradition might be a touch less biblical, you still have your way of making cookies, brownies, cakes, and everything in between that no other family does. Embrace your nostalgia. To make enough sugar cookies to feed a family of four, you need butter, sugar, baking powder, salt, flour, vanilla extract, and an egg. If you spend more than $10 on that, you’re probably importing the world’s finest sugar from the Palace of Versailles’ kitchen. 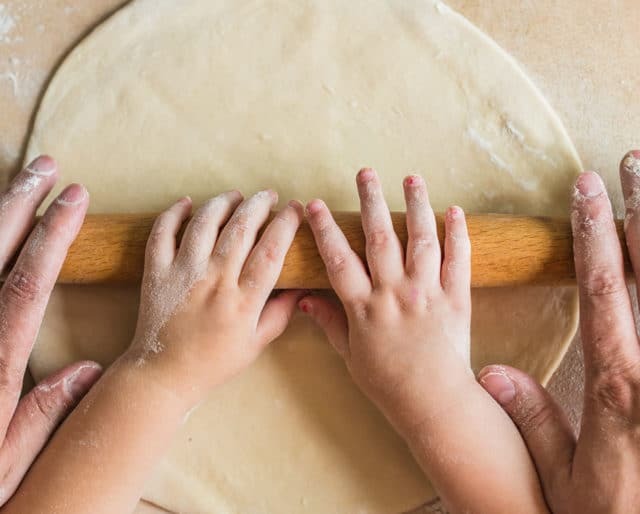 As you and your family dig into making bagels from scratch, you’ll inevitably get your hands covered in flour, raw dough, and other fun ingredients. This means *gasp* that the phones will have to remain in the chef’s pockets as conversation abounds between family members.